It is the mission of the Music Ministry of Boiling Springs Baptist Church to lead all its members into a deeper experience of the Lordship of Jesus Christ. It is our goal to make a purposeful effort to involve individuals of the church in meaningful music experiences. It consists of people. Persons in the life of the church share directly and indirectly in the music experiences planned and directed through the Music Ministry. Individuals benefit through active and passive roles, being part of the making of the sound or being recipients of the experiences. These roles include congregational singing, choral groups, and instrumental groups. The Music Ministry, through the experiences for which it is responsible, has the opportunity to enrich, strengthen and increase the understanding of all the persons whose life it touches. By becoming more personally involved in the hymn singing of the congregation, individuals can have new awareness of this opportunity for Christian expression. A greater opportunity for personal growth and understanding exists in the participation in music groups – choral and instrumental. The development of music skills – music reading, singing, playing and the broadening of musical understanding – is opportunities that the music ministry should provide. The Music Ministry is an organized effort using musical experiences to help the church accomplish its mission through congregational singing, choirs, instrumentalists and soloists. It is a purposeful effort seeking to glorify God, lead people to Christ, contribute to spiritual growth, and musical growth of all members. Its work touches hearts, opens minds and makes a way for every person to witness God’s redemption. 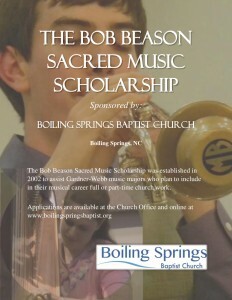 The Music Ministry of Boiling Springs Baptist Church is an organized effort using musical experiences to help the church accomplish its mission through congregational singing, choirs, instrumentalists and soloists. It is a purposeful effort seeking to glorify God, lead people to Christ, and contribute to the spiritual and musical growth of all church members. Its work touches hearts, opens minds and makes a way for every person to witness God’s redemption. The music ministry includes the following: Children’s choirs (ages 3 – grade 6); Sanctuary Choir (Adults); Youth and Adult Handbell Choirs. For a description of the choirs of the music program, click here.